1. You need to create a blog post buzzing about this competition. A link back to this blog is required. 3. Once you've blog about it, please leave your post URL in the comment below so that I can check it out. This is very important!!! If you don't leave your URL then I wouldn't know if you've blog about it and your entry will be disqualified. 4. The most creative post will win. Winner will be chosen based on hardwork and creativity. Let me give you some hint: Photoshop skills do help, or tell me what look you want to create with this palette, or do you want to win this for a special someone. I''ll leave it up to your creativity. Just impress me! 5. This competition runs from now until 17th May 2013. Winner will be announced on 18th May 2013 on this blog. Prize will be sent out first week of May. 6. Open to all Malaysia residents only. If you don't have a blog, please wait for another competition I will be having on Facebook and Twitter sometime in May or June. 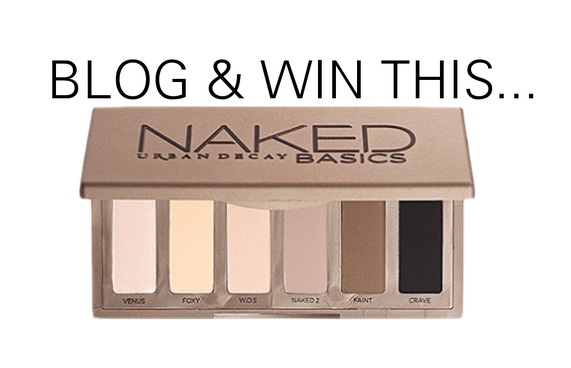 The prize will be something of equivalent value, but maybe not the Naked Basics palette again. And don't wait til last minute. The earlier you submit your entry, the more time I have to check out your post. I will link all the participants blog on my Love Links tab as a token of appreciation. Good luck! And may the best post win. OMG! Thanks for having this giveaway! I just can't missed it!! So lucky I found this before the closing date!! I'm so excited for this giveaway!! !